We all know that exercise is an important component of a healthy lifestyle. But did you know taking part in daily fitness activities as a family has numerous benefits as well? 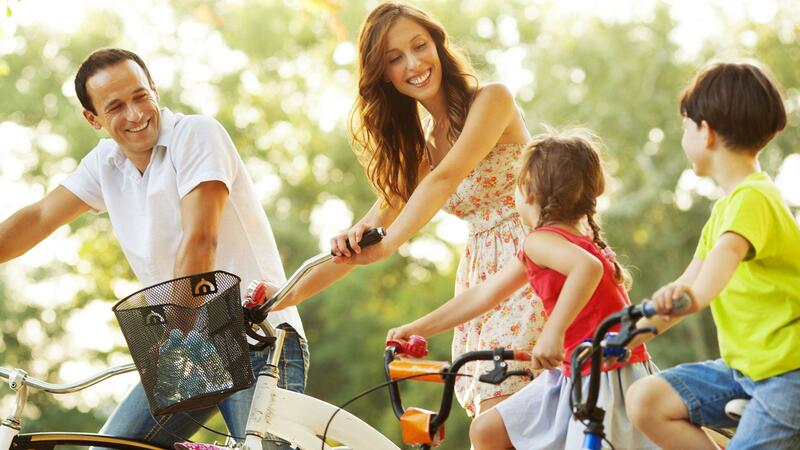 Here are just a few reasons to get exercising with the whole family. Many factors can contribute to childhood obesity, from a sedentary lifestyle to food marketing and misinformation. So it seems only natural to get kids moving from a young age. By getting your kids to connect physical activity with thoughts of togetherness, community and fun, you can guide them toward furthering those beliefs with age. And positive, long-term habits aren’t restricted to young people. You can make lasting changes in your own life and beliefs as well. Taking the step to get physically active with your family could be the beginning of a lifelong enjoyment of fitness for you and other adult members of your family. Generally speaking, you spend more time with your family than you do with anyone else. So when the people you spend the majority of your days with are all interested in exercise, the chances that a physical activity will be suggested are far more likely. Your daughter may comment that it’s a nice day and you should all go for a walk, or your son may suggest a game of touch football in the park. Before you know it, you’re having fun and getting exercise without even realizing it. When families today think of “family time,” it often involves going to see a movie or staying in to watch TV together. Although such activities certainly have their place, as they are great for relaxing and unwinding, how much conversation really takes place? Everyone is often lost in his or her own thoughts, and no real communication occurs. With exercise, however, there is no other option but to talk with one another and work as a team. Whether you’re playing tennis, going for a tough jog or strolling leisurely through the park, you are granted the opportunity to focus on your interactions and the goals you are accomplishing together. It doesn’t get much more rewarding! Playing video games, watching TV or surfing the web all have their time and place, but let’s face it: When you do any of these activities for too long, you soon start to feel sluggish and unproductive. Exercising with your family gives you the chance to get outside, breathe some fresh air and really get to know the people you spend each and every day with. And there are no rules when it comes to how you exercise. If you feel like getting started with an easy walk around the block or paddle in your local pool, that’s great. Or if you thrive on competition and like organizing activities such as dance competitions or baseball tournaments, that’s wonderful too. Experiment until you find those activities that make you happy, and then run with them!